Dawn… Naturally glowing skin! Dawn’s essential ingredients are easily absorbed into the skin. The unique blend of Special Oils, Vitamin E and Glycerine gives your skin the natural moisture it needs for 24-hour moisturisation. Leaving your skin feeling silky smooth and soft. The natural smelling fragrances ensure you feel fresh and give you the confidence you need to face the day. Use Dawn for Naturally Glowing Skin. 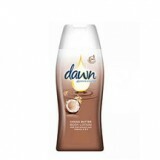 Dawn products can be found in Clicks stores in South Africa, Namibia and Botswana.